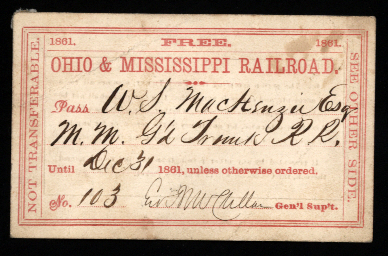 Free Ticket on the Ohio & Mississippi Railroad issued to W.S.Mackenzie Esq. M.M. G’d Trunk R.R., until December 31 1861, signed ‘Geo. B.McClellan’ as General Superintendent. 2¼ x 3½ inches, one corner crease, minor blemishes only. 1861. Major-General George Brinton McClellan (1826-85) took the field with the Army of the Potomac in April 1862. He was superseded by General Burnside in November 1862.